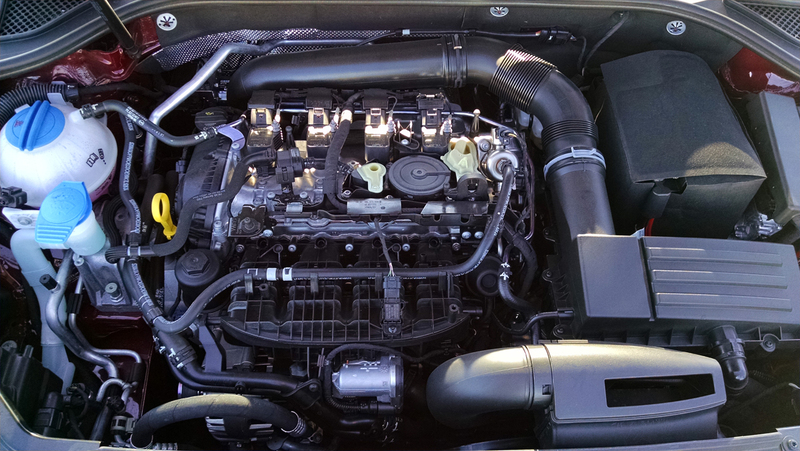 The standard engine now for the Volkwagen Passat is now the brand’s 1.8-liter turbocharged four-cylinder EA888 mill, replacing the old naturally aspirated 2.5-liter five cylinder engine a couple years ago. And though it’s smaller than the 2.5, it offers the same horsepower at 170 but has more torque at 184 pound-feet. In the Passat it’s available with one transmissions, an Aisin built six-speed automatic. This EA888 engine is the third-generation, now with a number of improvements that net better horsepower and fuel efficiency as well as quicker response and drivability. Design enhancements have also made it lighter than the second-generation. Though lighter, construction still starts with an iron block that pays off in the noise, vibration and harshness character. Making this possible is a thin-wall casting that allows sections of the block to be less an an eighth of an inch thick. Also paying dividends in the refinement department are two chain driven balance shafts that offset the vibrations and oscillations of the main rotating assemblies. The head is cast of aluminum with dual overhead cams, only one of which – the intake cam, has a variable timing capability. New for this engine, the exhaust manifold is cast into the the head, allowing its turbocharger to bolt directly to it. Exhaust then benefits from water cooling which lowers temperatures by up to 160 degrees, allowing for a leaner fuel mixture. This and a shorter route to the compressor gives the engine has less turbo lag and better fuel economy. 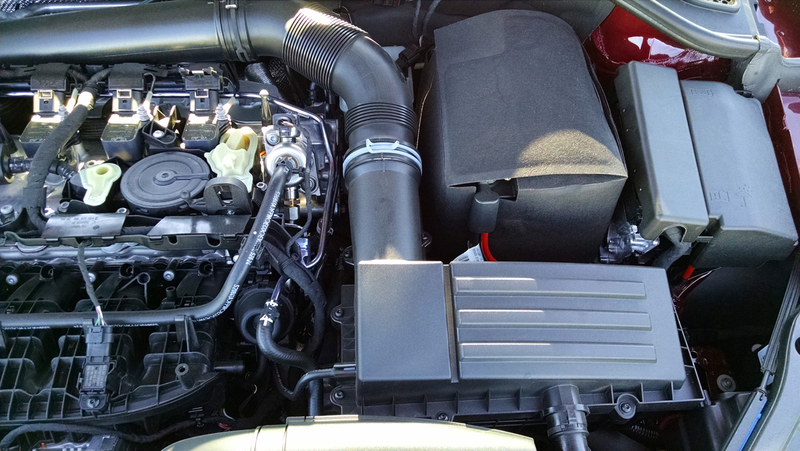 Following the air flow, the intake charge comes in through the filter box up front on the driver side, then back to the turbocharger at the rear of the engine. It’s hard to see with the air tube hiding it well from above. 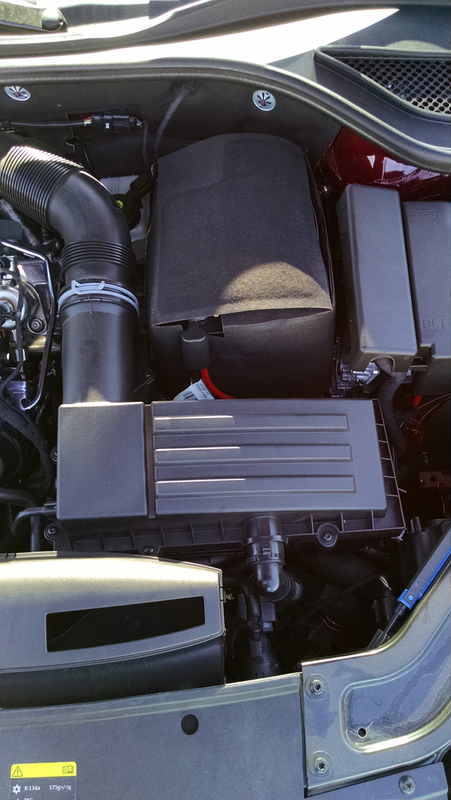 From there air travels up front to an air-to-air intercooler ahead of the radiator, then into the composite intake manifold at the front of the engine. 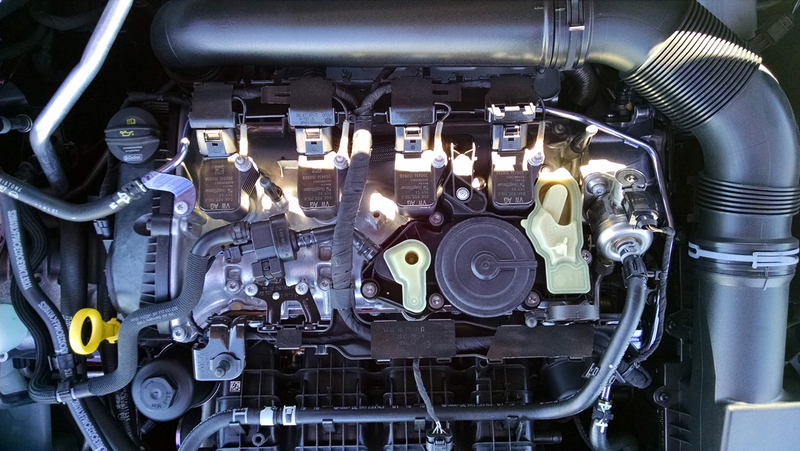 Direct fuel-injection feeds the cylinders, injectors hidden down below the intake manifold. Servicing the engine is actually pretty straight forward in spite of the fact this is one tightly packed engine compartment. Luckily everything is up on top and easy to identify as well as reach. 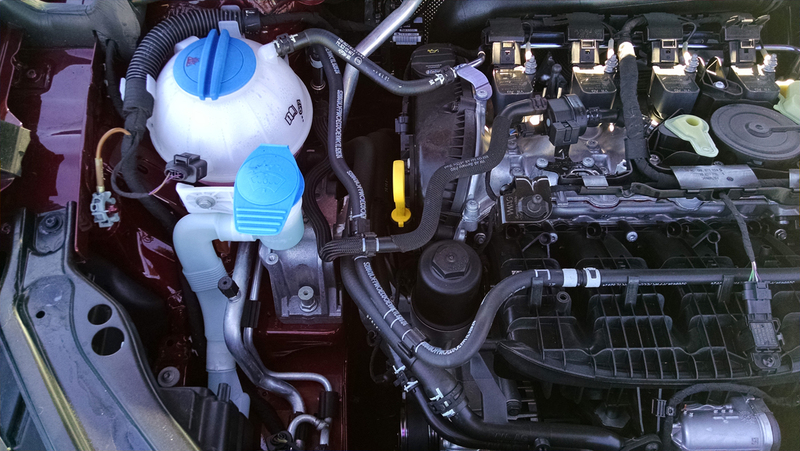 This starts with the windshield washer fluid and coolant reservoirs on the passenger side, and just to the right of them is the oil level dipstick tube. 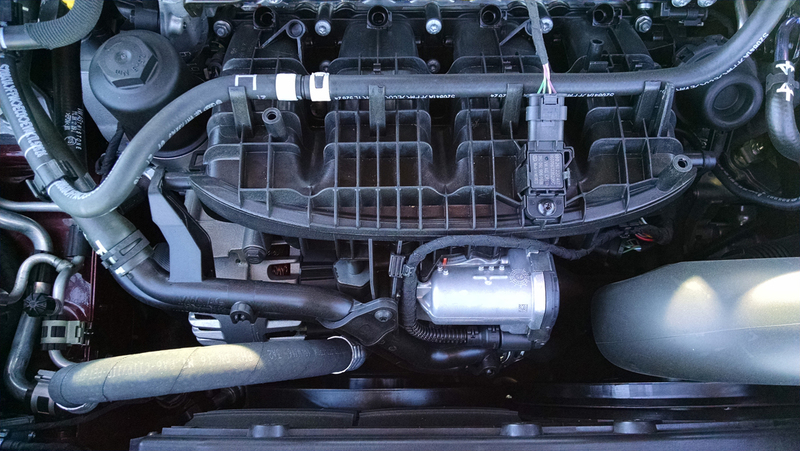 The oil filter is conveniently located on top of the engine for easy changing. 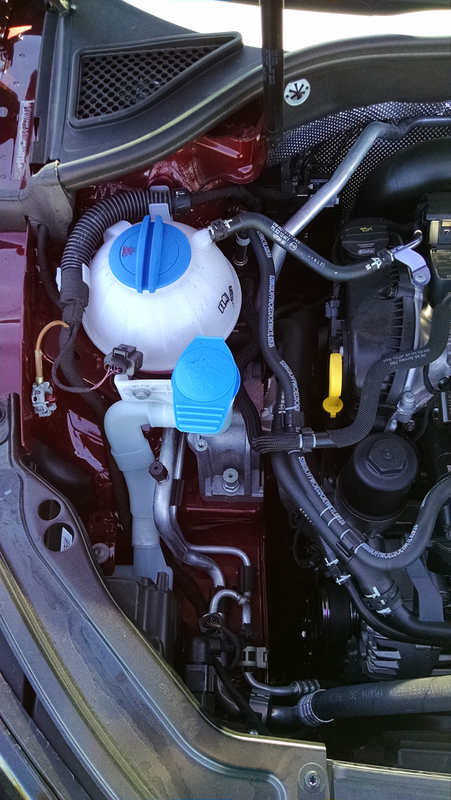 The oil fill cap also can be found at the passenger side top of the engine. 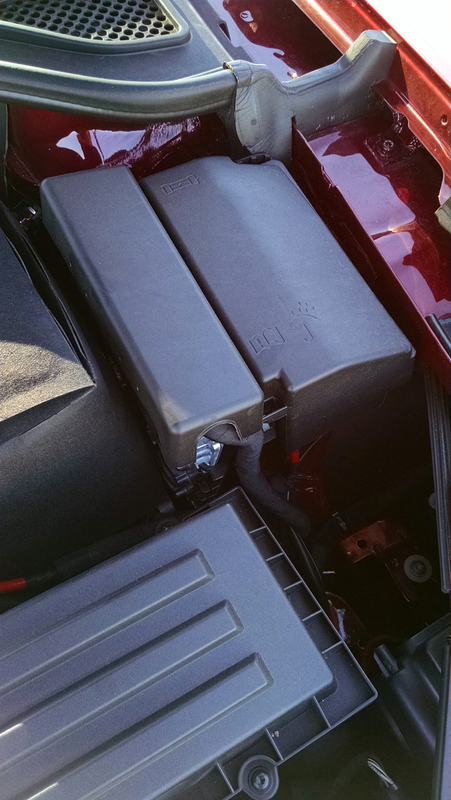 On the driver side is the air filter box which does require a Torx tool to open. Behind that is the battery, neatly wrapped in a thermal jacket. Next to that is the ECU and main fuse block. Reaching and checking the brake fluid is just down behind the battery and under the air inlet tube, requiring a funnel to top off neatly.